I'm excited that in a week's time I'll be heading off on my next overseas adventures - this time to Europe! Check out my travel photos on Instagram: Leigh-Chantelle & Viva la Vegan! I'm leaving Brisbane, Australia on 15 May and will be overseas until the end of August. I'm mostly going to speak at various Summer vegan events, and to catch up with a lot of my friends and some family over that side of the world. 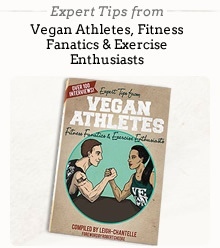 My Vegan Athletes Book also sells the best in Europe, so that was another reason why I jumped at the chance to head there. I was aiming to go in October 2016, but it was just going to be WAY too cold for me considering I don't really like anything under 20 degrees Celcius... This will be my first time over that side of the world, so I'm excited about trying something new. I'm quite experienced with travel in America and South East Asia, so it's a bit out of my comfort zone, but I'm sure the ride will be worth it! Please have a look through my itinerary below, and get in touch if you'd like to catch up, have ideas of places I should visit, places I can stay, and people who might want to be interviewed for my Interviews with Inspiring Vegans series. I love trains, so train trips and road trips are up the top of my list of things to do. I've got a few weeks spare here and there in between events, and am open to exploring new areas. I much prefer the coast and mountains to the cities. May 19 - 22 Staying with my good friend Jeremy (Vegan Perfection) and his wife Bec in Corsham, near Bath. How can we learn from other countries and cultures as we advocate respect for animals, animal rights, and veganism abroad? Join 20-year vegan veteran Leigh-Chantelle as she shares her expertise in International travel, activism, and promoting the vegan lifestyle. From her home in Australia, to her many travels to South East Asia and America, learn about engaging in activism while travelling, issues unique to specific regions/cultures/governments, the bond and division caused by identifying as vegan, and supporting activism abroad while sitting on your couch. Find out about some of Australia’s progresses and challenges, and how the online world has helped spread the image of diversity of the vegan movement and message around the world - or has it? WATCH THE VIDEO OF MY PRESENTATION. So many people are mean online, don’t listen, don’t read, and don’t communicate well. How do we as vegans and activists remember to rise above the negativity, and focus on our aims and core values? 20-year vegan veteran Leigh-Chantelle shares her expertise on how to effectively use our time and energy to promote the positive aspects of veganism, and inspire others to lead by example online. Learn more about how to communicate effectively online, work together, deal with trolls, online etiquette, and how to be the best vegan you can be - online and beyond. WATCH THE VIDEO OF MY PRESENTATION. WATCH my promo video for Bristol. See their website for more info. 20 years ago, most people didn’t know what a vegan was, let alone how to pronounce the term! Cut to now and veganism seems to be on trend in a lot of ways, in a lot of areas in the world. Join 20-year vegan veteran Leigh-Chantelle as she shares the changes - both good and bad - she’s experienced over the past 20 years on her vegan journey. Find out the areas we need to focus on for the long-term growth of an inclusive, ethical vegan lifestyle for all. Find out some of the past and present challenges, what’s changed, and what’s stayed the same in the vegan and activism movement. WATCH THE VIDEO OF MY PRESENTATION. WATCH my promo video for Manchester. See their website for more info. Being vegan is not enough, we need to be using our skills to promote the positive and inclusive elements of the vegan lifestyle when we can. Leigh-Chantelle shares her expertise on how to effectively use our time and energy to promote the core ethics of veganism online, and inspire others to become more effective activists in every possible arena. Learn more about working together, dealing with trolls, online etiquette and leading by example from a 20-year vegan veteran. Find out more about how you can help promote and market yourself, your product, your brand or your vision for a better world using Social Media and other means online. WATCH THE VIDEO OF MY PRESENTATION. Monday 12 - Friday 16 June staying with Geoff, a friend of a friend, in Swanage. So many people are mean online, don’t listen, don’t read, and don’t communicate well. How do we as vegans and activists remember to rise above the negativity, and focus on our aims and core values? 20-year vegan veteran Leigh-Chantelle shares her expertise on how to effectively use our time and energy to promote the positive aspects of veganism, and inspire others to lead by example online. Learn more about how to communicate effectively online, work together, deal with trolls, online etiquette, and how to be the best vegan you can be - online and beyond. Being vegan is not enough, we need to be using our skills to promote the positive and inclusive elements of the vegan lifestyle when we can. Leigh-Chantelle shares her expertise on how to effectively use our time and energy to promote the core ethics of veganism online, and inspire others to become more effective activists in every possible arena. Learn more about working together, dealing with trolls, online etiquette and leading by example from a 20-year vegan veteran. Find out more about how you can help promote and market yourself, your product, your brand or your vision for a better world using Social Media and other means online. WATCH my promo video for Bournemouth. See their website for more info. On Monday 19 June I'll be heading to Alicante, Spain to stay with Ted and Jacqui (two train friends who I met on a sleeper train from Butterworth, Malaysia to Bangkok, Thailand). 8 July will be in South Tyrol, Northern Italy with Jean Paul (one of my favourite travel companions, who I met on a bus in Java, Indonesia years ago) for 10 days. Update mid-June: This event has been cancelled. WATCH my promo video for Isle of Wight. See their website for more info. 2 August still in Netherlands, this time in Kampen for a few nights with (long-term friend and ex-workmate) Maritza and her partner Cas. 7 August staying with Constantin (one of my favourite travel companions, who I met in an Ubud bungalow years ago) in Groningen for my last few nights in Netherlands. How can we learn from other countries and cultures as we advocate respect for animals, animal rights, and veganism abroad? Join 20-year vegan veteran Leigh-Chantelle as she shares her expertise in International travel, activism, and promoting the vegan lifestyle. From her home in Australia, to her many travels to South East Asia and America, learn about engaging in activism while travelling, issues unique to specific regions/cultures/governments, the bond and division caused by identifying as vegan, and supporting activism abroad while sitting on your couch. Find out about some of Australia’s progresses and challenges, and how the online world has helped spread the image of diversity of the vegan movement and message around the world - or has it? WATCH my promo video for Liverpool. See their website for more info. Sunday 13 heading to Westbury on Severn to stay with (clients and friends) Lee and Sue at their new house in the countryside for a couple of nights. Tuesday 15 stayed in Leeds at an Air BnB (my first!) for a couple of nights so I could go on a steam train from Keighley to Haworth, where the Bronte sisters are from. This one one of the highlights of my trip. Leaving London on Wednesday 23 August, but won't be home for awhile as I'm heading to Bali to chill out after all this travel!! Home in Brisbane, Australia end of September now. Want to see what I've been doing? See my travel photos on Instagram: Leigh-Chantelle & Viva la Vegan!